If you've been procrastinating on your Christmas shopping like many of us, you're probably still scratching your head thinking about the perfect gift to buy for a work buddy, family member, or loved one. Living on Okinawa, you might find that a traditional Okinawan gift is about as original of a gift as you'll be able to find anywhere. However, there are hundreds of shops all over Okinawa selling a number of great Okinawan cultural crafts, and visiting each one might prove to be quite a hassle. For instance, if you think a coffee mug might be an excellent gift for your brother-in-law, the Tsuboya district in Naha City is very well known for its excellent craftsmanship in pottery. Easy enough. However, if you think your sister would absolutely love Okinawan lacquerware, then you'll have to add another stop to your list of places to visit before Christmas. The bad news is: Christmas is right around the corner, and there's hardly any time left for shopping at dozens of Okinawan crafts shops. The good news is: you don't have to! This weekend I visited the Naha City Tradition and Industrial Arts Center just south of the Naha City Airport. I had heard that this was a great place to learn about Okinawan arts and crafts, but I had no idea about anything else. What I found was that here you can learn about Okinawan arts and crafts as well as get some experience of your own learning how to do them. 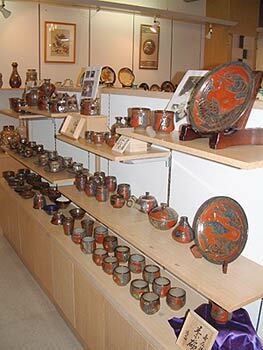 The center also has a very large gift shop selling a great variety of Okinawan goods including tsuboya-yaki pottery, Ryukyu glass, Shuri-ori weaving, and more! Looking for that perfect Okinawan gift? Look no further! There are certainly many places on Okinawa where you can learn to make traditional Okinawan arts and crafts, but few places teach as many crafts as the Naha City Tradition and Industrial Arts Center. However, as the staff speaks very little English, I recommend you bring a Japanese friend if possible. You have the opportunity to learn to make Ryukyu glass, Tsuboya-yaki (Tsuboya Pottery),bingatta, and Ryukyu lacquerware. You can make reservations over the phone by calling the center at 098-858-6655, but it might be quite a hassle if you don't speak the local language. However, you can usually make reservations during your visit. Each class costs ¥2,500. The Ryukyu glass demonstration only takes ten minutes and you can pick up your item the following day or have it shipped to you for a small fee. You have he option of making a small vase for one flower or an original drinking glass. Class times run from 10 a.m. to 12 p.m. and 1 p.m. to 5 p.m. The Tsuboya-yaki demonstration is held three times every day and takes about two hours. The three separate classes take place at 10 a.m., 1 p.m., and 3 p.m., and you'll be able to pick up your item three weeks later or have it shipped to you. If you choose to join in the Tsuboya-yaki class, you have the option of either making a handmade Shisa lion plate or using a potter's wheel to make a cup or plate. The bingatta demonstration is also held three times every day, but it lasts only ninety minutes. Classes are held during the same time as the Tsuboya-yaki classes, and afterwards you'll be able to take your own original handmade table-center home with you. If you'd like to try your hand at making Ryukyuan lacquerware, you'll need to come with a group of at least fifteen people. The lacquerware class is available only with advance reservations, so call ahead of time and organize a group get-together with a bunch of friends if this sounds interesting to you. After finishing your original lacquerware tray, you'll be able to take your item home the same day! Aside from the four available classes, there is a lot more to see at the Naha City Tradition and Industrial Arts Center. The facility has four main areas: the special exhibition room, permanent exhibition room, demonstration facility, and private exhibition room. 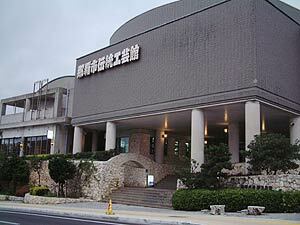 The special exhibition room has a great number of arts and crafts made by some of Okinawa's most acclaimed artists. It also has a small theater and a few small video booths where you can learn more about the history of some of Okinawa's arts and artists, but the videos are all in Japanese. However, though I can't speak much Japanese, I still found the videos very interesting to watch. The Permanent Exhibition Room is really both a museum and a gift shop. Here, you can see many beautiful Okinawan arts and crafts, and if you see something that catches your attention in a special way, you can purchase it as well. Also, prices are very affordable. I've seen the same items sold at smaller shops for much higher prices. Those looking to get the most for their money should definitely check out this room. The exhibition room is very large and has a great variety of Okinawan crafts including Tsuboya-yaki, Ryukyu glass, Ryukyu lacquerware, bingatta, and Shuri-ori weaving. At the demonstration facility, you can watch real Okinawan artists make Ryukyu glass, Tsuboya-yaki, bingatta, and lacquerware right in front of you. This is also where you can try your hand at making the crafts yourself if you sign up for one of the four previously mentioned classes. Finally, the private exhibition room sits on the third floor of the Naha City Tradition and Industrial Arts Center and is available for rent for displaying personal artwork. During my visit, Shuri-ori crafts were on display. Next week's exhibit will be Tsuboya-yaki. The exhibition changes frequently, so each time you visit the facility you'll see something new. I was really impressed with the facility as a whole. Over the years, I have taken a few classes on Ryukyu glass and tsuboya-yaki making, but I have never found a place offering lessons on such a variety of crafts in one building! Now that I've found this place, I plan on visiting frequently and trying each of the available crafts. Why not?! The opportunity is certainly there! The biggest difficulty many foreigners might find about getting to the Naha City Tradition and Industrial Arts Center is that it is quite a ways away from most places on Okinawa unless you live in Naha City or even further south on Okinawa. The center is located just south of the Naha City Airport. Finding the building isn't so difficult once you've made the long drive. Head south on highway 58 until you get near the airport. Eventually, at the end of highway 58, the road splits in two with a ramp veering to the right heading towards the Naha Airport and road going straight towards Itoman. Do not get on the ramp heading towards the Airport! Head straight! Highway 58 becomes route 331 here. Continue straight and you should see a big red water tank nearby. This is the landmark to remember. Heading south, you'll soon see the facility on your right. Make a U-turn as soon as possible and turn left into the facility. Free parking is available. If you get lost, ask a local to point you towards the "dentou kogeikan." The building is close to the Akamine monorail station. 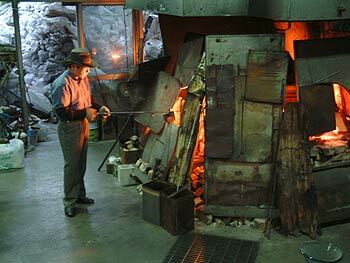 The Naha City Tradition and Industrial Arts center is open from 9 a.m. to 6 p.m. everyday except for Tuesdays. However, if Tuesday falls on a Japanese holiday, the facility will be open. Admission is ¥300 for adults, ¥200 for high school students, and ¥100 for middle and elementary school students.